Absolutely fantastic experience especially the tours. 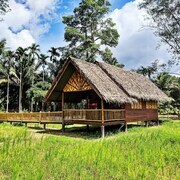 Surprising comfortable accommodation and mosquito free! Surat Thani was given its current name by King Rama VI in 1915 and prior to this it was known as Chaiya. 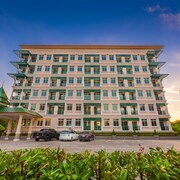 Modern-day Surat Thani is one of Thailand’s largest cities. 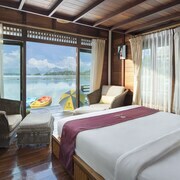 It is 600 km south of Bangkok and the gateway to the popular Gulf of Thailand islands of Koh Samui and Koh Phangan. 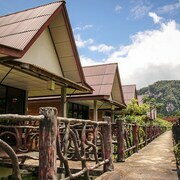 Most travellers use the town as a transit point when heading for ferries to the islands or across country to Phuket and Krabi. 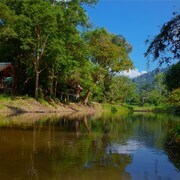 In addition to ferries, Surat Thani is well connected to the southern Thai transport network and has its own railway and bus stations plus an airport. The railway station and the airport are a little way out of town. Public songthaews (local buses) are easiest to use when travelling around town or to and from transport stations. There are a number of Buddhist temples in Surat Thani. Wat Phra That Si Surat boasts ornate pavilions and Buddha statues plus nice views over town, while Wat Pattanaram is an easy choice for those who don’t want to walk too far. The Pirates Park Water is a good option for children and the young at heart. Phum Riang is the nearest beach. Nakwaree is a shooting club open to non-members and Khun Chaba's Mulberry Farm offers the chance of picking your own fruit. Khao Sok National Park is 80 km from town and a popular excursion destination featuring majestic limestone peaks, virgin forest and Cheow Larn Lake. 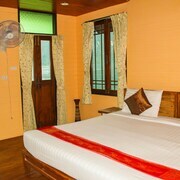 Peerless Khao Sok experiences include trekking, kayaking, caving and overnight stays at raft houses. Visitors looking to enjoy Thailand’s famous street food will find the Wonderland Night Market and San Chao Night Market close to the east bank of the Tapi River both suit. Noodle soups, pad Thai fried noodles, curry or seafood on rice, and snacks such as grilled squid on sticks, grilled prawns, waffles, and fried meatballs and insects are among the numerous choices. The city’s CentralPlaza Mall has food courts and various eateries selling international food. Surat Thani is not noted for 24/7 partying but has a reasonable selection of pubs and bars on Amphur Road and Talad Mai Road. The beer garden at the Wonderland Night Market tends to attract a mixed crowd of Thais and foreigners. Shopping options are plentiful in Surat Thani. Vendors at Wonderland and San Chao night markets sell a limited selection of souvenirs, knick-knacks, clothing, beachwear and footwear. 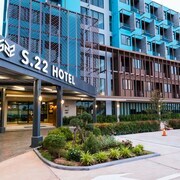 Tesco and Big C both have large stores in town, while the local CentralPlaza Mall offers upmarket shopping with international and Thai brand name outlets. Surat Thani’s must buy products are Phum Riang silk and Chaiya salted eggs. 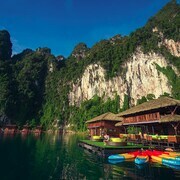 Explore Surat Thani with Expedia.co.th’s Travel Guides to find the best flights, cars, holiday packages and more!